It's been 11 years since I had a mother. Time has a way of tenderizing your memories. I wish I could call her to make her laugh. Sometimes she visits me in my dreams. I am a mother too, but I have been a feral one. I was and am a working mom. to know that they are strong and capable. they know that they are very much loved. who may have not had that at all. Mother's day can be kind of painful. I am sharing a picture of my Busia with you. Because any day with Busia in it is a good day. Even if you felt like you didn't need it. Sniff... where is the kleenex? Your post touched my heart. Happy Mother's Day to you. I love all of your pictures, and your thoughts. All well said! Happy Mothers Day Janice. My mother raised me to be independent and I I did the same with my kids. It's an important gift. It was hard to read this--my eyes were all wet!! Powerful and insightful. My mother also raised me to be independent, she supported me leaving for America. I couldn't have asked for a better mom. She's been gone for 30 years this fall, but I still talk to her and she lives in my heart. With Errol. Love you my friend. Happy Mother's Day. Happy Mother's Day to you. I lost my mom when I was just 18 and she only 45, so this can be a painful day. Here's to feral mothers everywhere, even those long gone. I always need a hug. 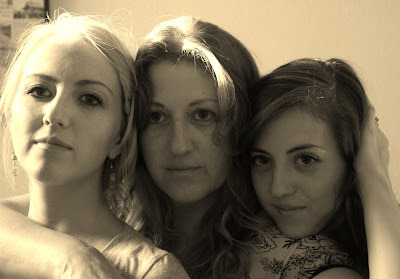 I tend to think that feral mothers are the best - had I been a mother, I would have undoubtedly been a feral mother. I am mother to my dogs - and they are the best I could hope for. Hope you had a wonderful day. The photo of you and your daughters is SPECTACULAR!